In this particular game, you get a booklet that allows you to keep track of the progress of some of the side quests in the game. To get the "full game" experience (and get lots of spiffy items and masks), you need to complete each character in the Notebook. 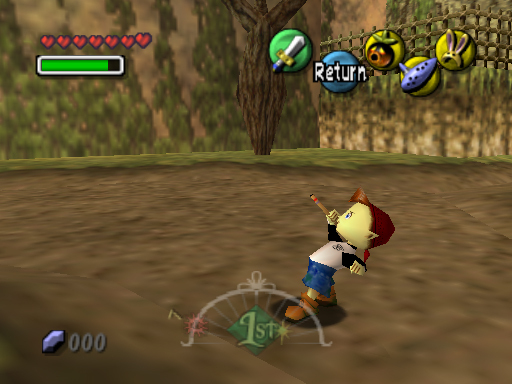 - These kids hang around Clock Town as well as the Astral Observatory in Termina Field through a secret passage. They have a Secret Society of Justice and try to do good deeds for everyone. 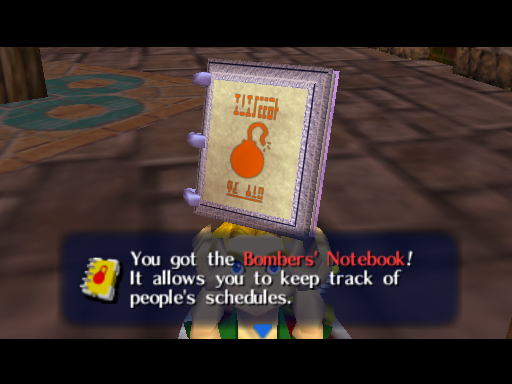 6:00 PM - In North Clock Town, the leader of the Bombers, Jim, is attempting to pop the Majora balloon. Pop it for using Bubble Blasts (Deku Mask), Arrows, or any other projectile. - After you find them all, you'll receive the password to enter the sewers. Write it down and save it for later. 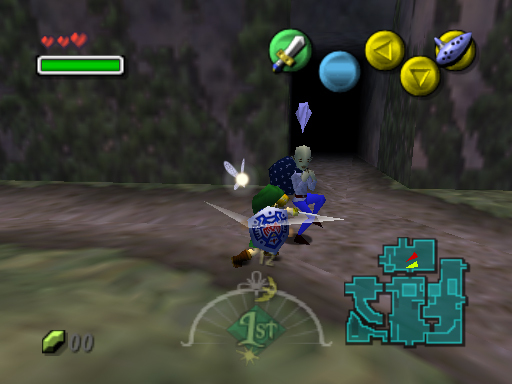 * Playing hide & go seek again (as normal Link). * Entering and exiting the sewers using the password you got last time (you must do this as normal Link). - This polite young woman is the owner of the Stock Pot Inn in East Clock Town. With the stressed out Groman's Traveling Troupe staying at the Inn, her grandmother not eating anything, the moon about to fall, and her fianc� missing, Anju is afraid. Can we help reunite the two lovers?. 3:50 PM - All of Anju's events are covered in the Anju & Kafei Quest. It's strongly suggested you view that section to complete her events. 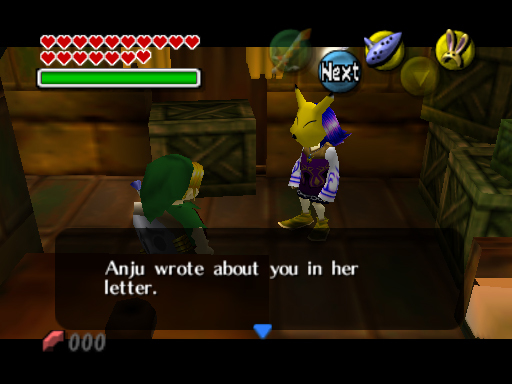 - Only AFTER the Postman leaves, speak with Anju at the Stock Pot Inn in Clock Town. She'll confuse you with a Goron of the same name and give you a key. This is required for the later events. 8:00 PM - After you've completed the first event, (gotten the Room Key,) speak with Anju again, this time wearing the Mask of Kafei. She will ask you to meet her in the kitchen later. 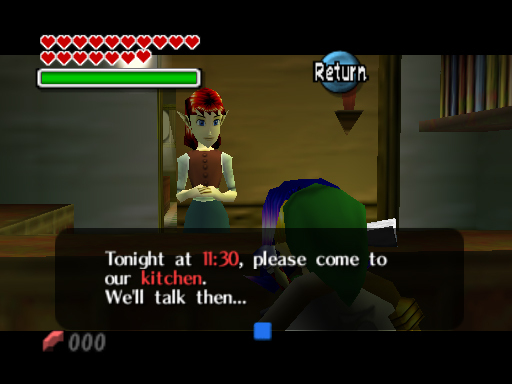 6:00 AM - Meet Anju in the kitchen that night and speak with her to get the Letter to Kafei. Go mail it and wait until morning. Follow the Postman to find Kafei. 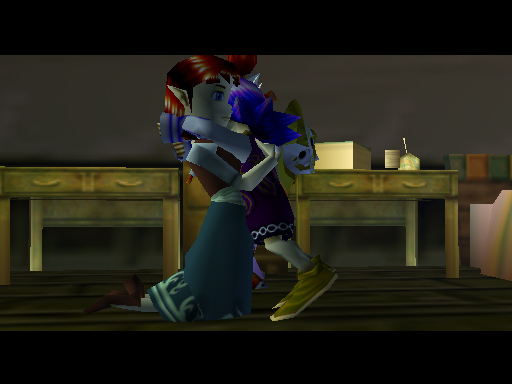 7:00 PM - After you get the Pendant of Memories from Kafei, go back to the Stock Pot Inn and give it to Anju. This will stop her from evacuating Clock Town with her mother and everyone else. 1:30 left - If you've completed the rest of the Anju & Kafei Quest and helped Kafei at Sakon's Hideout, go back to Clock Town and wait with Anju in the Employee's Only Room for Kafei to return. - At 1:30 remaining, he will appear and you'll witness the couple being reunited. Their masks will combine and they'll give you the Couple's Mask as thanks. - The Mayor's son is engaged to Anju, that sweet young lady who owns the Stock Pot Inn. Recently, he has gone missing and his mother is looking for a detective to find him. Are you up to the task? 3:50 PM - This is all part of the Anju & Kafei Quest, in order for this event to take place, you must complete some of Anju's. 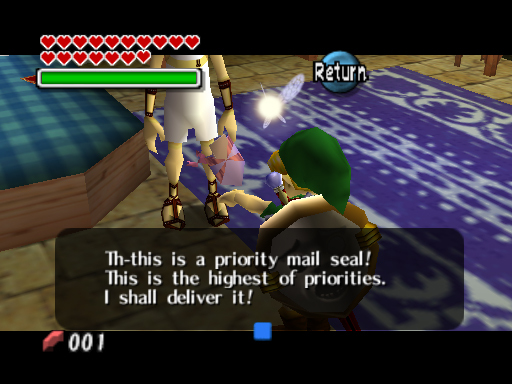 - After mailing the Letter to Kafei, go to the Laundry Pool in Clock Town at 3:00 PM. The Postman will show up and deliver the letter. While Kafei is outside, run inside the now unlocked hideout and wait for him. - When Kafei returns, speak with him to get the Pendant of Memories. 6:00 PM - This event and the following are part of the Anju & Kafei Quest. Also, for this event to take place, you MUST NOT SAVE THE OLD WOMAN IN NORTH CLOCK TOWN ON THE FIRST NIGHT! - Go to Ikana Canyon at 6:00 PM of the Final Night and go to the area near the beginning to the right. Here, you'll find Kafei hiding behind some rocks, waiting for Sakon, who will appear at 6:15 and enter the hideout at 7:00. Follow him and Kafei inside. - Inside, you will play as both Link and Kafei. As Link you kill enemies to open doors and as Kafei, you step on switches to change the conveir belt speed and open doors. Kafei: Push a block onto blue switch. Kafei: Avoid red, touch yellow. Blue's in corner. Kafei: Try to push/pull blocks onto the yellow block and avoid the red one entirely. Try to push the block above the blue on onto it. - This guy is a childhood friend of Kafei, the missing person. He owns a shop in town that sells stolen goods. Despite that, he's a good guy and wants to help. All the events in this entry are part of the Anju & Kafei Quest. 10:00 PM - This event is accomplished in the midst of the Anju & Kafei Quest. Between 1:00 PM and 10:00 PM, Kafei's Hideout at the Laundry Pool will be unlocked. Speak with the Curiosity Shop Owner inside to receive the Keaton Mask. 10:00 PM - Along with the item received in the previous event, you will also get the Letter to Mama. 5:00 AM - This final event can be done separately from the rest and requires that you save the old lady in North Clock Town on the First Night at 12:00 AM. 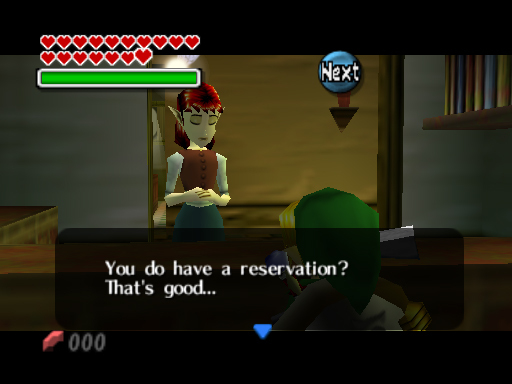 - You'll need the Giant's Wallet and 500 Rupees. Go to West Clock Town and enter the Curiosity Shop on during the Final Night. 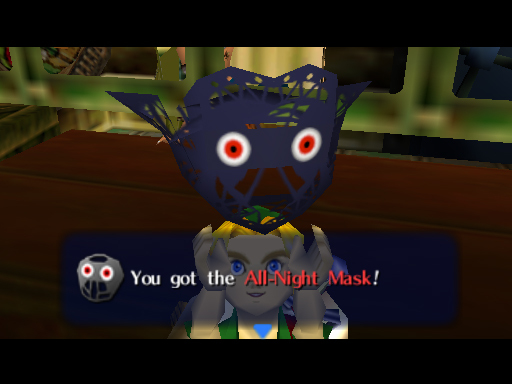 He will be selling the All-Night Mask for 500 Rupees. - This old lady is bringing Big Bomb Bags to stock at the Bomb Shop. 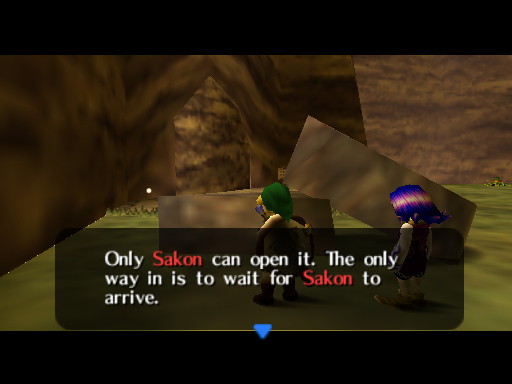 Unfortunately, Sakon the Thief plans on stealing them from her. Can we save her and collect a nifty bag? 12:20 AM - On the First Night at 12:00 AM, the old lady will pop out of the exit in North Clock Town. By 12:20, Sakon will prance over and steal her giant sack. Chase him down and slash him with your sword. - The old lady will thank you and give you the Blast Mask. In the morning, you can purchase Big Bomb Bags at the Bomb Shop in East Clock Town. - This red-headed girl lives on the ranch with the same name as her. She's very sweet, and protective of the farm animals? 6:00 PM - Go to Romani Ranch on the First Day and blast the boulder with a Powder Keg. Speak with Romani to learn her plight about the aliens. 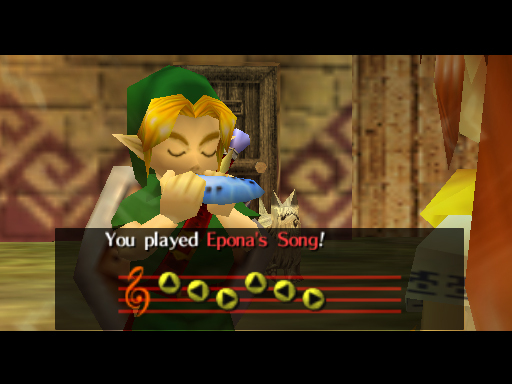 Practice with her and she'll then teach you Epona's Song, which allows you to call your horse whenever you want. 5:30 AM - After agreeing to help Romani on the First Day, make sure you're at Romani Ranch at 2:00 AM. "They" will start to appear and slowly make their way to the barn. 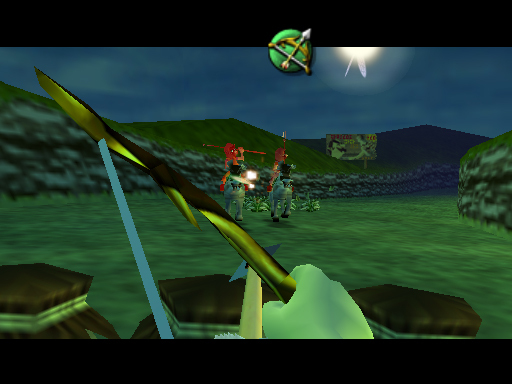 - Ride Epona around and shoot them with Arrows to kill them. They drop Arrows when killed and there's also a ton hidden in the bushes, so bear that in mind. - I suggest circling the barn to ensure you get them in a cycle. If the dog begins growling, it means one is getting close. If it's too hard, or you don't want to try very hard, play the Inverted Song of Time to slow them down to 1/3 that of normal. At 5:30, Romani will reward you with Empty Bottle #3. - The pretty owner of Romani Ranch. There are several obstacles keeping their milk from being delivered to Clock Town. Perhaps we can help. blow up the boulder on Milk Road with a Powder Keg as well as save Romani and the Cows from alien abduction. - Go to Romani Ranch at 6:00 PM of the Second Night and speak with Cremia to tag along for her milk delivery. Milk Road will be blocked, so you'll have to take a dangerous route. - Use your bow to keep the thieves (Gorman Brothers) away from the milk. If you have the Circus Leader's Mask, use that to scare them away. If you can save all of the bottles, you'll be rewarded with Romani's Mask. - This short, gray-haired man is the indecisive mayor of Clock Town. At the moment, he is unsure if they should evacuate Clock Town or keep the Carnival of Time going. Maybe we can help him come to a decision. 8:00 PM - Go to the Mayor's Residence in East Clock Town and enter the door on the left. 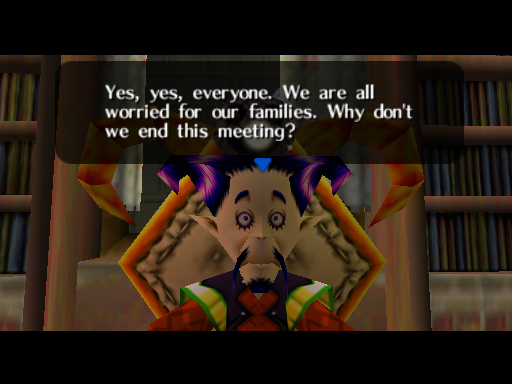 Speak to anyone inside while wearing the Couple's Mask to stop the arguing and save the Mayor from a horrible meeting. He'll give you Heart Piece #15 in thanks. - This fat woman with a yellow dress and hideous floating hair is the wife of Mayor Dotour. She's in charge of the preparations for the Carnival of Time. 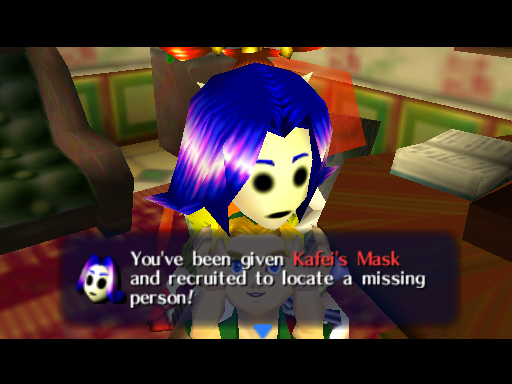 Her son, Kafei, has recently gone missing. 8:00 PM - Go to the Mayor's Residence and enter the door on the right. Speak with the fat woman and accept her request to hunt down her son. 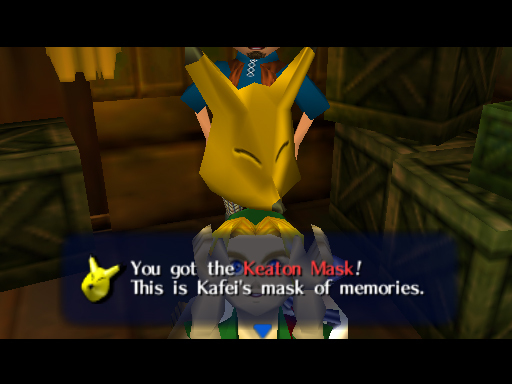 She'll then give you Kafei's Mask. 6:00 AM - This next section is near the end of the Anju & Kafei quest (see that section for details). 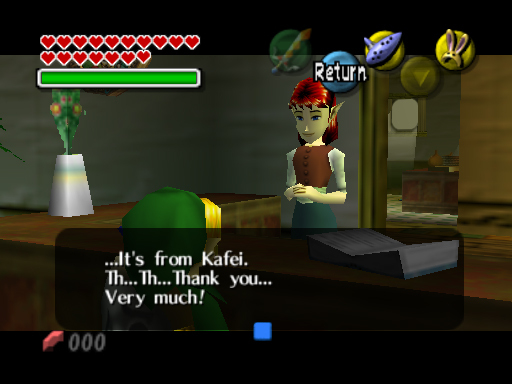 After you get the Letter to Mama from the Curiosity Shop Owner, go to the Latte Milk Bar in East Clock Town and put on Kafei's Mask. Speak to Madam Aroma and give her the letter. She'll reward you with an Empty Bottle. - Leader of the Gorman Traveling Troupe, this grumpy man is in deep trouble because of his act being cancelled due to the moon. Can we lighten the mood?. 6:00 AM - You'll find this guy drinking away at the Latte Milk Bar in East Clock Town on the First and Second Nights. 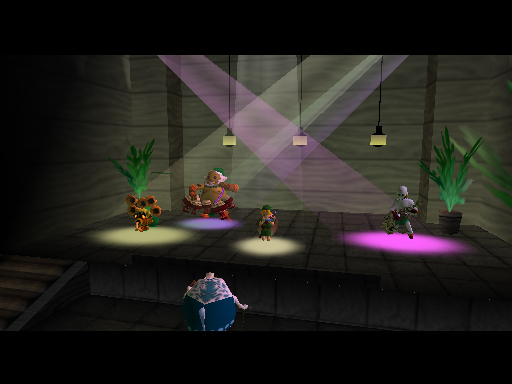 Go hang out with Toto (the fat Zora nearby) and play the four parts of his song using your transformation masks. - Once the song is complete, Gorman will burst into tears and give you the Circus Leader's Mask as thanks. - The plump manager of the Indigo-Go's can be found at the Mayor's Residence or the Latte Milk Bar in Clock Town. Because Lulu lost her voice, their performance, as well as Gorman's, are cancelled. 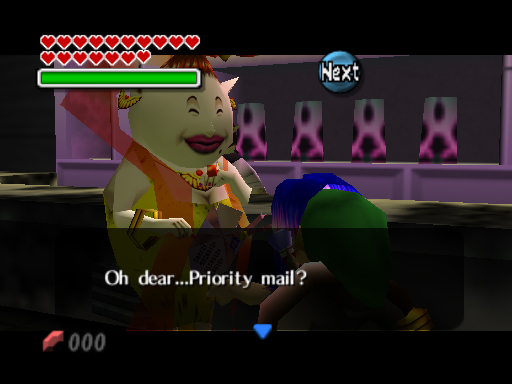 - The guy who delivers the mail in Clock Town lives on a strict schedule and wants to escape the falling moon. Can we convince him to flee and abandon his civic duty to save his life? 12:00 AM - During the evening, the Postman will be training at the Post Office. You can play a little mini-game in which you attempt to stop the clock at exactly 10 seconds. It costs 2 Rupees a try, so bring a bunch. - I suggest turning off the sound (the clicking is off beat with the seconds) and getting a stop watch or a hand watch. Alternatively, you can wear the Bunny Hood so you can see the seconds the entire time. - Once you complete this task, he will reward you with Heart Piece #5. 6:00 AM - This event is part of the Anju & Kafei Quest. 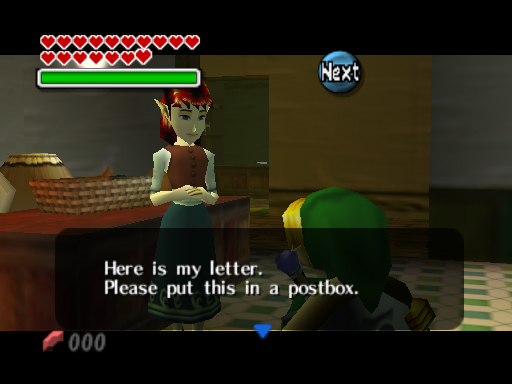 If you've delivered the Letter to Kafei to a postbox on the First or Second Night, the Postman will deliver it, making this event possible. 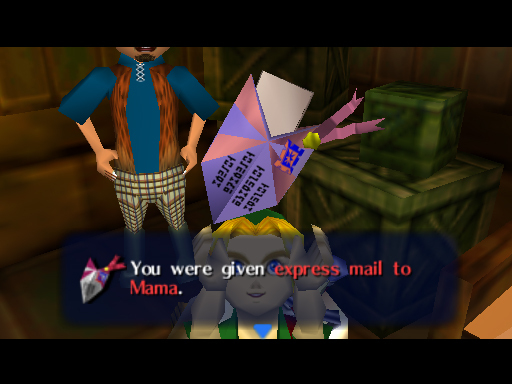 - After you get the Letter to Mama from the Curiosity Shop Owner at Kafei's Hideout, put it in a postbox and allow the Postman to deliver it. Follow him to the Milk Bar where he delivers it to Madame Aroma. - Talk to him when he comes outside and stalls in front of the exit to receive the Postman's Hat. - The twin dancers of the Gorman Traveling Troupe are restless about coming up with a new dance before the carnival. Can we help? 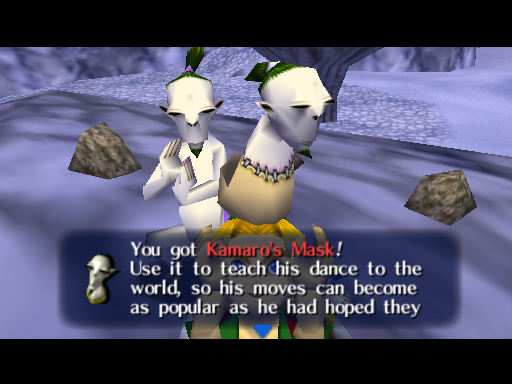 6:00 AM - On the First or Second Night, go to West Clock Town and dance for the Rosa Sisters while wearing Kamaro's Mask. They will spread Kamaro's madness throughout the world and call you their sensei. How sweet. Yes, they give you a Heart Piece as well. - There is a hand inside the toilet at the Stock Pot Inn. It's in desperate need of a substitute toilet paper. Can you save the day? 6:00 AM - The hand from Link's Awakening makes an appearance! 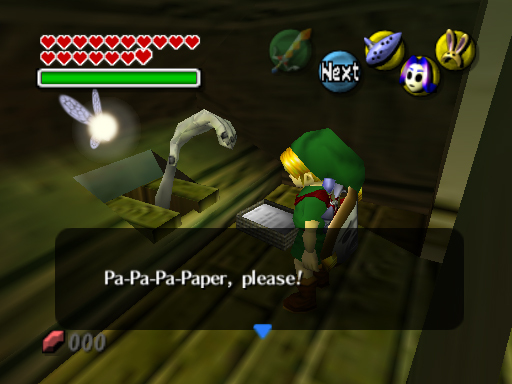 His problem is the same in this Zelda title, he lives in the toilet and he needs paper. - Bring him either a Letter or a Title Deed and claim your Piece of a Heart reward. 12:00 AM - Go to the Stock Pot Inn and enter the door on the first story. Put on the All-Night Mask and speak with the old woman. * Listen to the first story, do all the top answers. * Listen to the second story, choose "I dunno". - This guy is the spirit of the charismatic dancer who regrets not being able to share his dance with the rest of the world. 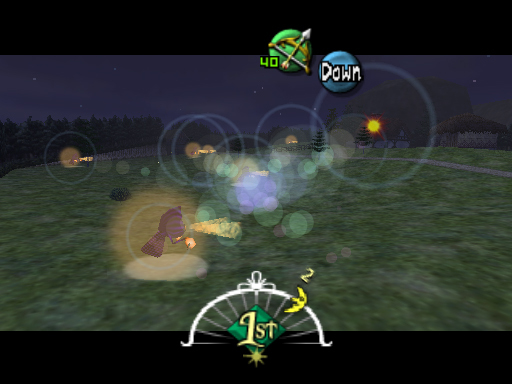 6:00 AM - You can find him dancing in Termina Field atop one of those mushroom rocks to the northwest of the entrance to North Clock Town. - Speak with him to discover his regrets. Play the Song of Healing to heal his soul, receive the Kamaro's Mask to share his dance with the world, and earn a sticker in your Notebook. - The Cucco loving guy realizes he probably won't live through the moon falling, and only regrets not seeing his chicks grow up. 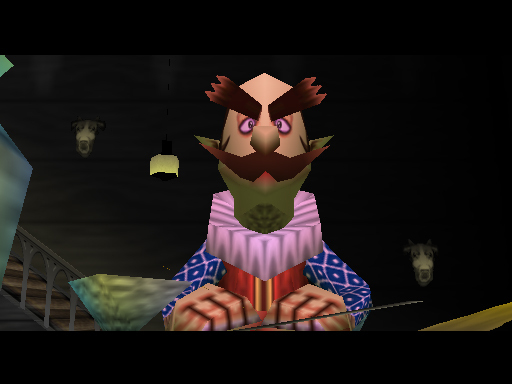 8:00 PM - You can find him during any day inside the Cucco shack at the back of Romani Ranch. He's depressed because he won't live to see the baby Cuccos grow old. 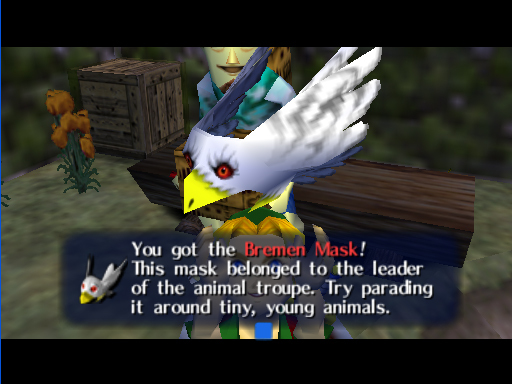 - Whip out the Bremen Mask and parade around the area, collecting the babies as you go. After you find all ten of them, wait for them to one by one grow into roosters. To show his gratitude, he will reward you with the Bunny Hood. - These suspicious twins own the Gorman Racetrack on Milk Road. They are very stingy and will do anything to get ahead of Romani Ranch nearby. 6:00 PM - Those Gorman Brothers have a Mask you need to get through the game known as the Garo Mask. 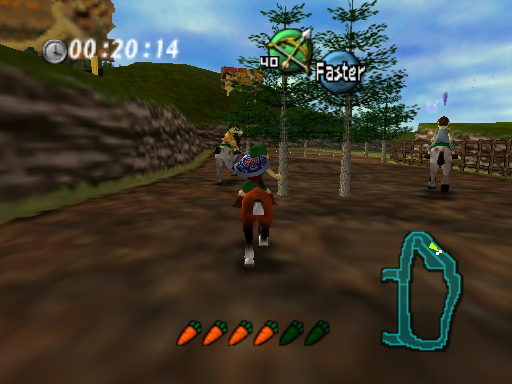 You can get it from them by bringing Epona to their racetrack and speaking with either of them. They'll challenge you to a race as a result. - The race is pretty simple as well as easy. Stick to inside and either use a carrot, wait for it to charge before using another, or use all of them and charge all at once. Be careful near the end because the hazards are much larger. Once you win, you'll receive your prize. - This poor Terminian soldier sits around, waving to those who pass by in the hope that someone will see him. The poor guy is invisible, and if you can find a way to heal him, he'll give you something spiffy! 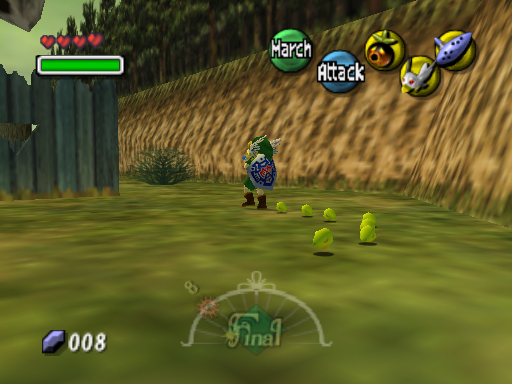 Any Time - Go to Ikana Valley (the area between Termina Field and Ikana Canyon) with Epona. 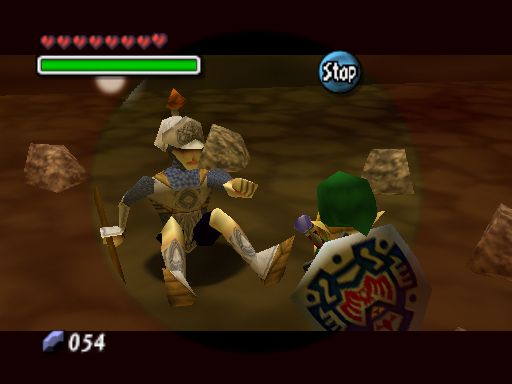 Right after the fences, before the one eyed red guy atop the cliff that leads to Ikana Canyon, there's a circle of stones on your right. Use the Lens of Truth to see an invisible soldier. - When he asks you for something to heal him, fork over a red potion to cure him of his "dullness". As thanks, he'll give you the Stone Mask he was wearing. 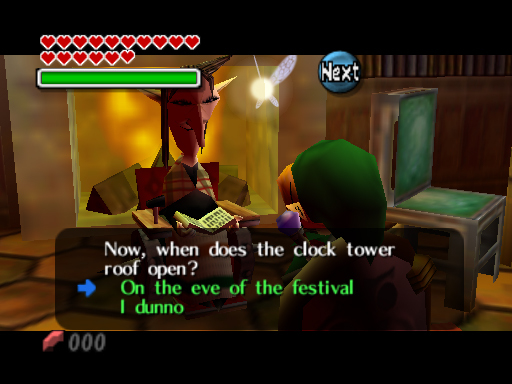 6:00 AM - Go to the Laundry Pool in Clock Town on the First or Second Night and speak with the music box guy to allow him to lament about his past. - Apparently, the guy used to be in an animal troupe with a dog as a leader. Out of jealousy, he stole the Bremen Mask. Now he gives it to you. Weird.